From LA to Istanbul — We’re Delivering 7x More Coverage! Check out our new Viasat-2 coverage map, and you’ll see it offers an expanded footprint, with seven times more coverage than its predecessor – Viasat-1. 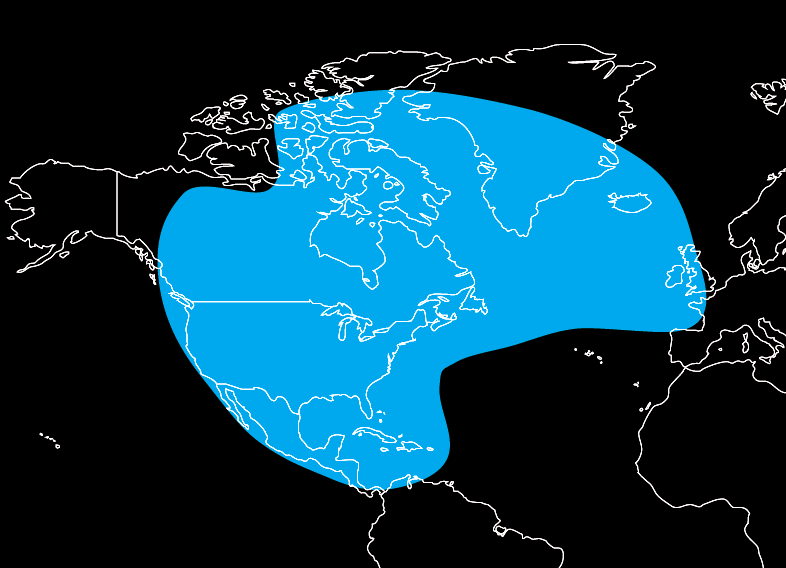 Viasat-2 is expected to deliver broadband services across North America, Central America, the Caribbean, a portion of northern South America as well as the primary aeronautical and maritime routes across the Atlantic Ocean bridging North America and Europe. In fact, broadband users traveling from North America to the Middle East have the ability to roam on the highest quality contiguous satellite broadband networks in order to stay connected. Users can connect to the Viasat-2 network and then roam onto the KA-SAT network, a high-capacity Ka-band satellite system part owned by Viasat through its European joint venture with Eutelsat that delivers broadband communications across Europe and the Mediterranean basin. The combined Viasat and KA-SAT networks represent well over half of all Ka-band capacity on orbit worldwide, share the same high-capacity satellite ecosystem, enabled by a Viasat designed and built terrestrial network infrastructure. The resulting high-capacity service area will enable the highest quality internet connections from Los Angeles to Istanbul, allowing customers to operate an array of fixed and mobile services including in-flight connectivity, maritime, emergency relief, oil and gas operations, and government applications anywhere within the combined coverage areas.